Influential Japanese artist Katsushika Hokusai, born 1760 in EDO, now Tokyo, best known for his wood block print series Thirty-Six Views of Mount Fuji, made his own path in the art of ukiyo-e, a style of wood block print making, impacted later artists of Japan and Europe’s Impressionism, and influenced the art of comic book making . He began painting at age 6, learning from his artisan father, the maker of decorated mirrors for the shogun. As a young teen ager, he was apprenticed to study the art of wood carving. When he was 18, he was accepted into the studio of Katsukawa Shunshō, where he practiced the art of ukiyo-e.
At this time, ukiyo-e depicted to courtesans and actors, and Hokusai’s first prints, published in 1779, were of Kabuki actors. He began experimenting with new subjects and styles, which resulted in his being expelled from the Katsukawa Shunshō studio. Using his religious beliefs as inspiration, he moved away from the popular subjects and focused on landscapes and images of daily life, new subject matter for the art of ukiyo-e. Mount Fuji, frequently depicted by Hokusai, had special significance to him as a symbol of eternal life. Between 1814 and 1820, he published 12 books or manga, as he called them, which are now considered by some to be the precursor to modern manga and comic books. Japan was not open to the western world at this time and while Hokusai’s works were acclaimed in Japan, he didn’t receive recognition abroad until after his death. He is now considered in the West to be one of the best-known Japanese artists. Hokusai was popularly known for his ukiyo-e print series 36 view of Mt. Fuji. His compiled art books or manga are considered a precursor to modern manga and comic books. His favorite subject matter to depict was the daily lives of Japanese people, as well as common cultural images and landscapes. Every Monday, on the Pennsylvania College of Art & Design blog, a different profile of an artist is posted. 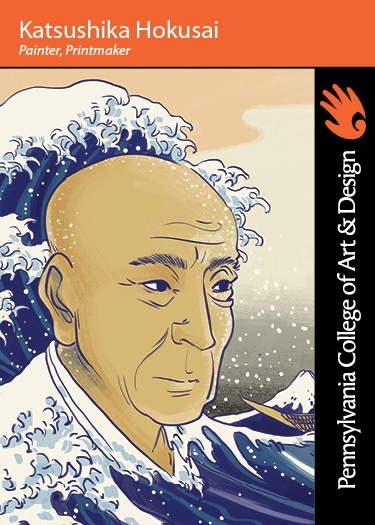 These are taken from a classroom project where the illustration and fine art students create “Artist Trading Cards,” first researching the facts about and the style of a selected artist, then making a trading card that captures the spirit of the artist.